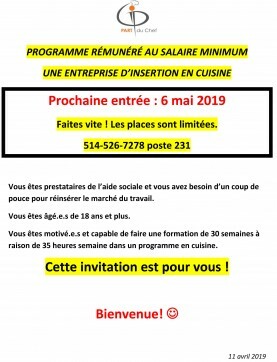 PART du Chef is a socioprofessional integration organization that offers its participants in formation the opportunity to experiment with different kitchen-related careers. Combined with the experience gained from different work settings, the training given represents a solid stepping-stone to employment for people with mental health or psychosocial problems. The program is operated in collaboration with Emploi-Québec and regularly accepts the admission of new participants. PART du Chef training may lead to different kitchen- and catering-related jobs in settings such as cafeterias, restaurants, cafés, snack bars and catering services. - Be struggling with a mental health or psychosocial problem without severe limitations to employment. - Be motivated to integrate or reintegrate into the labor market.